looking thing!' which I do not believe you will say, do not destroy it, but make a dress for it, and give it to your little sister, and she, I am sure, will be delighted, and call it 'pooty baby.' "
We thought it would be perfect for the living history community for historic sites or reenactments. We searched for one to reproduce and, in a stroke of luck, located a copy and the task began. It was our goal to reproduce a facimile that was so accurately copied that it would be difficult to tell from the original. Besides serving the reenacting community, as mentioned above, this printing also allows modern readers to see exactly a book that was available and the thoughts of the writer of 150 years ago. This version is the result of carefully scanning and cleaning the images of the original to remove the dirt, aged paper color, and blemishes that crept into this book over the 150 years since its first publication. 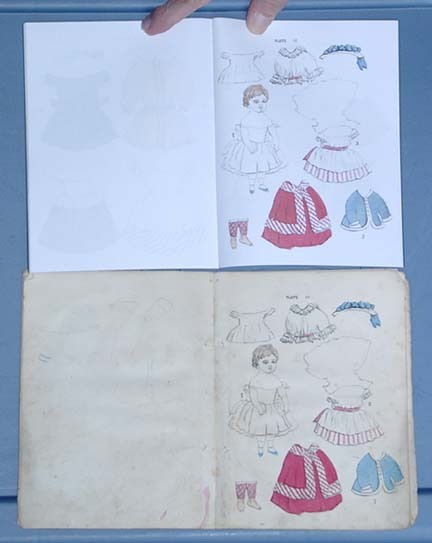 In the first illustration to the right, the original book is on the left with the reproduction to the right. You can see the size is the same (about 5 inches wide by 7 inches tall) and we strove to replicate the color of cover stock and the gold lettering. In the second image, there is one of the color plates. Although our cleaning was using electronic means, in order to replicate the original hand-coloring, we were careful in cleaning the plates not to delete the "slop over" if the original illustrator didn't stay within the lines or add color to fill in spaces if they didn't quite fill in the space. Working with the publisher, we were also able to get a very close match to the original shades of color. The original is the one on the bottom and you can see the close match of the new reproduction to the original printing. The only obvious change from the original is the addition of an ISBN number and the copyright information about this imprint on the copyright page. We hope you are as pleased with this book as we are to produce it! 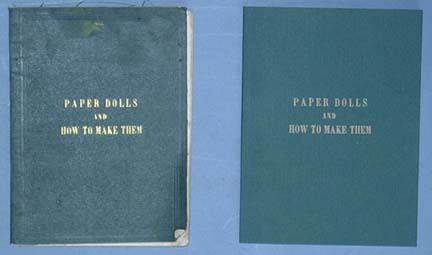 The cost of a copy of Paper Dolls and How to Make Them is $6.95.